Describe the effects of magnetic fields on moving charges. 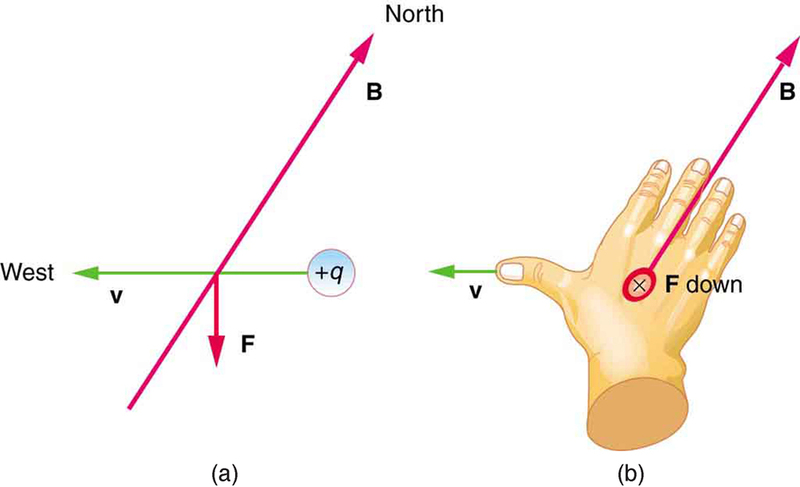 Use the right hand rule 1 to determine the velocity of a charge, the direction of the magnetic field, and the direction of the magnetic force on a moving charge. Calculate the magnetic force on a moving charge. What is the mechanism by which one magnet exerts a force on another? The answer is related to the fact that all magnetism is caused by current, the flow of charge. Magnetic fields exert forces on moving charges, and so they exert forces on other magnets, all of which have moving charges. where is the angle between the directions of and . This force is often called the Lorentz force. In fact, this is how we define the magnetic field strength —in terms of the force on a charged particle moving in a magnetic field. The SI unit for magnetic field strength is called the tesla (T) after the eccentric but brilliant inventor Nikola Tesla (1856–1943). To determine how the tesla relates to other SI units, we solve for . (note that C/s = A). Another smaller unit, called the gauss (G), where , is sometimes used. The strongest permanent magnets have fields near 2 T; superconducting electromagnets may attain 10 T or more. The Earth’s magnetic field on its surface is only about , or 0.5 G.
The direction of the magnetic force is perpendicular to the plane formed by and , as determined by the right hand rule 1 (or RHR-1), which is illustrated in Figure 1. RHR-1 states that, to determine the direction of the magnetic force on a positive moving charge, you point the thumb of the right hand in the direction of , the fingers in the direction of , and a perpendicular to the palm points in the direction of . One way to remember this is that there is one velocity, and so the thumb represents it. There are many field lines, and so the fingers represent them. The force is in the direction you would push with your palm. The force on a negative charge is in exactly the opposite direction to that on a positive charge. Figure 1. Magnetic fields exert forces on moving charges. This force is one of the most basic known. 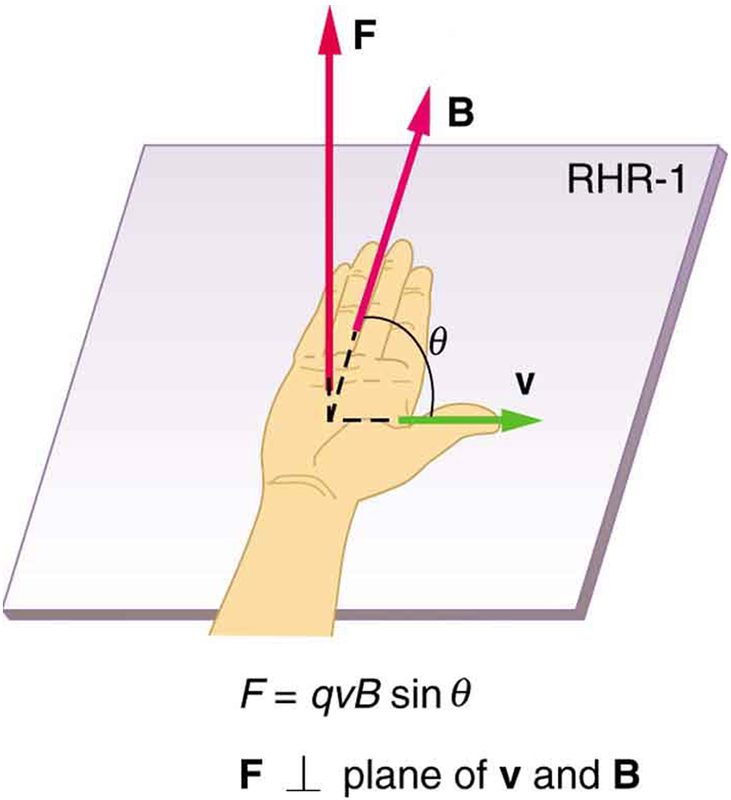 The direction of the magnetic force on a moving charge is perpendicular to the plane formed by v and B and follows right hand rule–1 (RHR-1) as shown. The magnitude of the force is proportional to q, v, B, and the sine of the angle between v and B. There is no magnetic force on static charges. However, there is a magnetic force on moving charges. When charges are stationary, their electric fields do not affect magnets. But, when charges move, they produce magnetic fields that exert forces on other magnets. When there is relative motion, a connection between electric and magnetic fields emerges—each affects the other. Figure 2. A positively charged object moving due west in a region where the Earth’s magnetic field is due north experiences a force that is straight down as shown. A negative charge moving in the same direction would feel a force straight up. We are given the charge, its velocity, and the magnetic field strength and direction. We can thus use the equation to find the force. This force is completely negligible on any macroscopic object, consistent with experience. (It is calculated to only one digit, since the Earth’s field varies with location and is given to only one digit.) The Earth’s magnetic field, however, does produce very important effects, particularly on submicroscopic particles. Some of these are explored in Chapter 22.5 Force on a Moving Charge in a Magnetic Field: Examples and Applications. where is the angle between the directions of and . The direction of the force on a moving charge is given by right hand rule 1 (RHR-1): Point the thumb of the right hand in the direction of , the fingers in the direction of , and a perpendicular to the palm points in the direction of . The force is perpendicular to the plane formed by and . Since the force is zero if is parallel to , charged particles often follow magnetic field lines rather than cross them. 1: If a charged particle moves in a straight line through some region of space, can you say that the magnetic field in that region is necessarily zero? 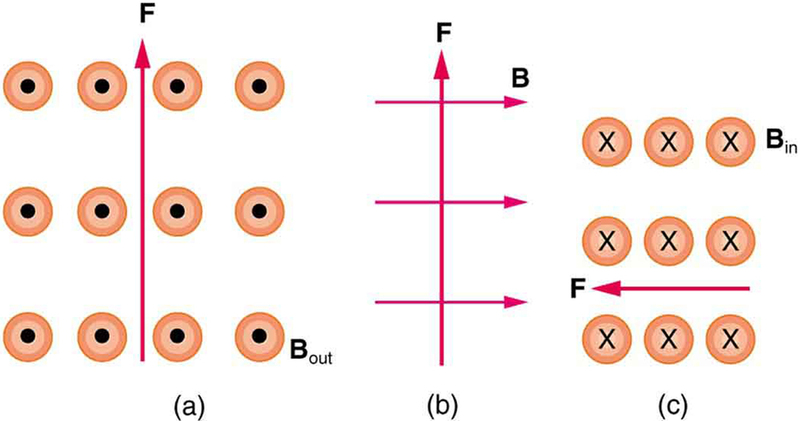 1: What is the direction of the magnetic force on a positive charge that moves as shown in each of the six cases shown in Figure 3? 2: Repeat Chapter 22.4 Problems & Exercises 1 for a negative charge. 3: What is the direction of the velocity of a negative charge that experiences the magnetic force shown in each of the three cases in Figure 4, assuming it moves perpendicular to ? 4: Repeat Chapter 22.4 Problems & Exercises 3 for a positive charge. 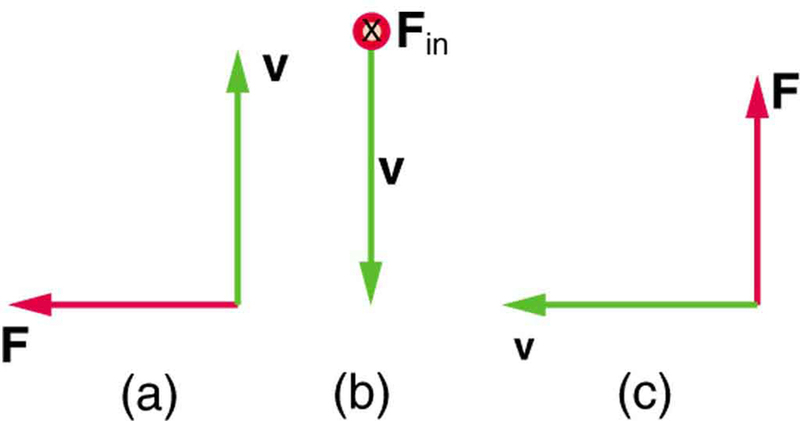 5: What is the direction of the magnetic field that produces the magnetic force on a positive charge as shown in each of the three cases in the figure below, assuming is perpendicular to ? 6: Repeat Chapter 22.4 Problems & Exercises 5 for a negative charge. 7: What is the maximum force on an aluminum rod with a charge that you pass between the poles of a 1.50-T permanent magnet at a speed of 5.00 m/s? In what direction is the force? 8: (a) Aircraft sometimes acquire small static charges. Suppose a supersonic jet has a charge and flies due west at a speed of 660 m/s over the Earth’s south magnetic pole, where the magnetic field points straight up. What are the direction and the magnitude of the magnetic force on the plane? (b) Discuss whether the value obtained in part (a) implies this is a significant or negligible effect. 9: (a) A cosmic ray proton moving toward the Earth at experiences a magnetic force of . What is the strength of the magnetic field if there is a angle between it and the proton’s velocity? (b) Is the value obtained in part (a) consistent with the known strength of the Earth’s magnetic field on its surface? Discuss. 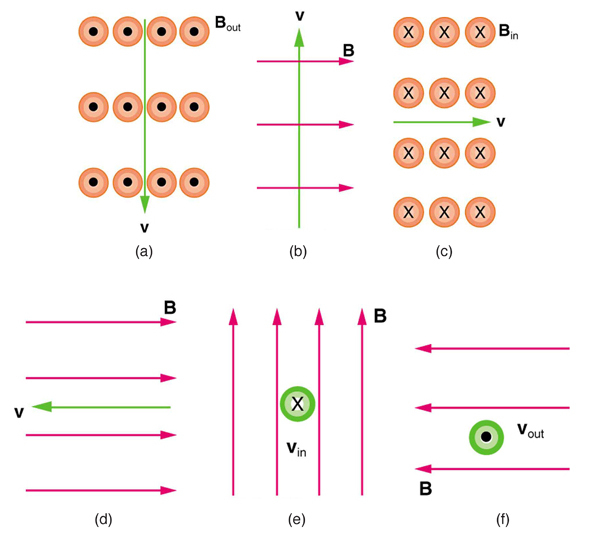 10: An electron moving at in a 1.25-T magnetic field experiences a magnetic force of . What angle does the velocity of the electron make with the magnetic field? There are two answers. 11: (a) A physicist performing a sensitive measurement wants to limit the magnetic force on a moving charge in her equipment to less than . What is the greatest the charge can be if it moves at a maximum speed of 30.0 m/s in the Earth’s field? (b) Discuss whether it would be difficult to limit the charge to less than the value found in (a) by comparing it with typical static electricity and noting that static is often absent. (b) This is slightly less then the magnetic field strength of at the surface of the Earth, so it is consistent. 22.4 Magnetic Field Strength: Force on a Moving Charge in a Magnetic Field by OpenStax is licensed under a Creative Commons Attribution 4.0 International License, except where otherwise noted.